This week, we've added two new releases to our Long Range Forecast. 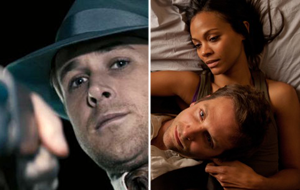 Gangster Squad and The Words are both currently set to release on Friday, September 7. - A strong cast that includes Ryan Gosling, Sean Penn and Emma Stone. - Moviegoers seem to be excited about the trailer, at least on the internet. - The Town found great success two Septembers ago and this seems to cater toward a similar crowd. - Drive didn't live up to its pre-release internet hype last year, at least in terms of being a break-out. - Moviegoers may decide to wait for the more familiar choices of Finding Nemo 3D and Resident Evil: Retribution a week later (particularly the latter). - Bradley Cooper proved to have drawing power with Limitless, although this doesn't feel as mainstream friendly as that film did. - Zoe Saldana's presence could help some as well. She previously helped Colombiana earn decent numbers. - Will that many moviegoers want to see a film about plagiarism, regardless of who is in it, or how good it is? - The trailer focuses heavily on the writing that takes place within the film. Focusing more on the dramatic and thriller aspects of the film instead could be more beneficial. - As mentioned, moviegoers may pass on this weekend in general as they wait for the following weekend's choices. Notable changes on our forecast this week: The Dark Knight Rises. Check out our predictions for these and other films in the table below. Gangster Squad Sep 7, 2012 Warner Bros. The Apparition Aug 24, 2012 Warner Bros.